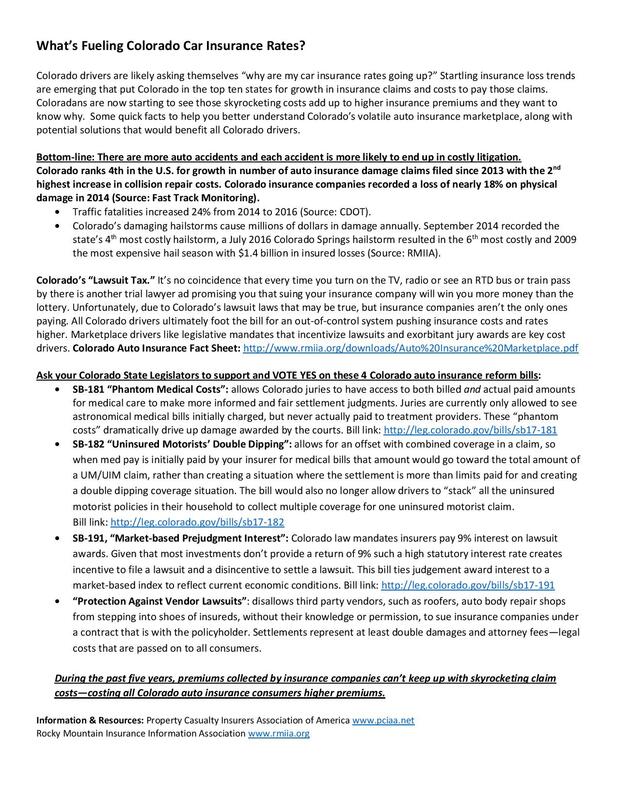 Fifteen years ago, Colorado Insurance rates were on a rollercoaster ride that had only one direction: UP. Drivers were in sticker shock over double-digit increases and paying the 8th highest premiums in the country. The runaway rate train? The state's costly no-fault auto insurance system. Colorado law required drivers to buy expensive mandated medical coverage, made wide-ranging alternative treatments commonplace and was a lawsuit "pot of gold". No-fault finally crashed in 2003 when public outcry pushed lawmakers to sunset the bloated mandates and return to fault-based auto insurance. Premiums plummeted by more than 30% on average and drivers could choose their insurance based on individual needs. 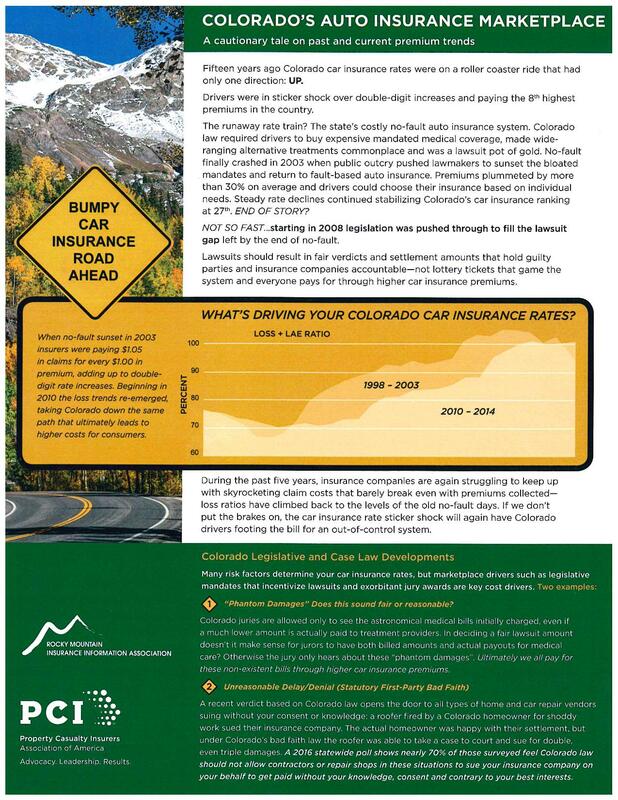 Steady rate declines continued stabilizing Colorado's car insurance ranking and 27th. END OF STORY? NOT SO FAST...starting in 2008, legislation was pushed through to fill the lawsuit gap left by the end of no-fault. Lawsuits should result in fair verdicts and settlement amounts that hold guilty parties and insurance companies accountable - not lottery tickets that game the system and everyone pays for, through higher car insurance premiums. BUMPY CAR INSURANCE ROAD AHEAD - When no-fault sunset in 2003, insurers were paying $1.05 in claims for every $1.00 in premium, adding up to double-digit rate increases. Beginning in 2010, the loss trends reemerged, taking Colorado down the same path that ultimately leads to higher costs for consumers. During the past 5 years, insurance companies are again struggling to keep up with skyrocketing claim costs that barely break even with premiums collected - loss ratios have climbed back to the levels of the old no-fault days. 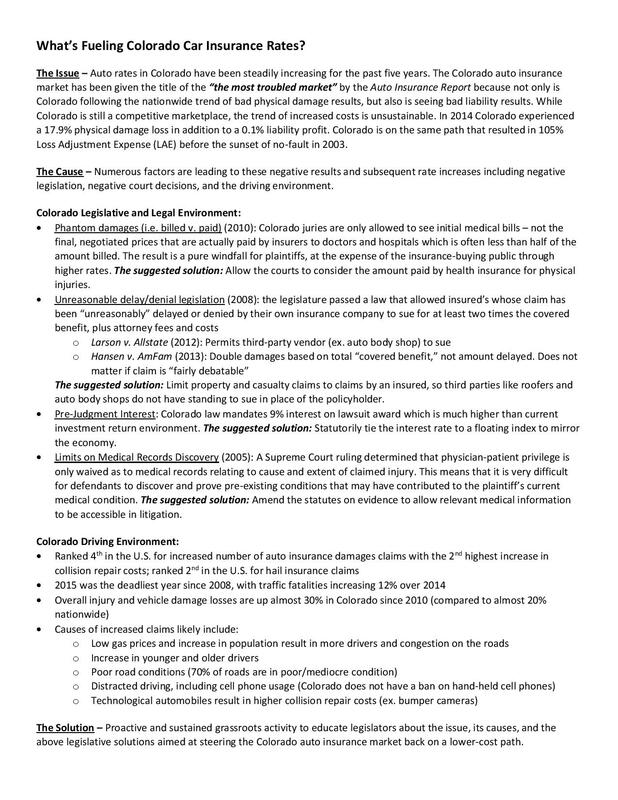 If we don't put the brakes on, the car insurance rate sticker shock will again have Colorado drivers footing the bill for an out of control system. "Phantom Damages" Does this sound fair or reasonable? - Colorado juries are allowed only to see the astronomical medical bills initially charged, even if a much lower amount is actually PAID to treatment providers. In deciding a fair lawsuit amount doesn't it make sense for jurors to have both billed amounts and actual payouts for medical care? Otherwise the jury only hears about these ""phantom damages". Ultimately, we all pay for these non-existent bills through higher car insurance premiums. Unreasonable Delay / Denial (Statutory First-Party Bad Faith) - A recent verdict based on Colorado law opens the door to all types of home and car repair vendors suing without your consent or knowledge. A roofer fired by a Colorado homeowner for shoddy work sued their insurance company. The actual homeowner was happy with their settlement but under Colorado's bad faith law, the roofer was able to take a case to court and sue for double, even triple damages. A 2016 statewide poll shows nearly 70% of those surveyed feel Colorado law should not allow contractors or repair shops in these situations to sue your insurance company on your behalf to get paid without your knowledge, consent and contrary to your best interests.